Happy Unity Friday Friends with Flair! I'll just make a quick post because I know you have lots of eye candy to check out today from so many talented Unity addicts today! For a complete list of participants, please visit the Unity blog! I started off with Mojo Monday's Sketch #111 as my inspiration and used Unity's Little Buggers stamp set for my card (I love how stinkin cute this set is!). I coloured the ladybug stamped on Neenah cs with Memento ink in with my copics, added some Stickles to the antennas, highlighted the ladybug with a Uniball white signo pen and cut it out with my Nestabilities. 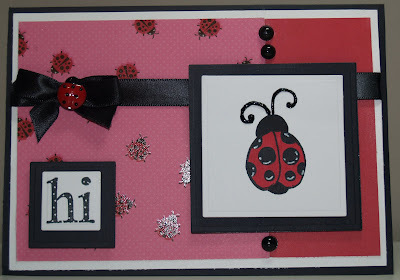 Dp paper is TCP studios, Bazzill and SU cardstock and dewdrops. U/k ribbon and lady bug button from my stash. That ladybug is so adorable! I love how you put this together ~ all the elements work so perfectly! Adorable- I love the paper and layout of the card. I love all those ladybugs! Super cute! So cute! Love all the ladybugs on the background, too! Wow Stephanie, this card is tooo cute! I love the layout and all your little details...fabulous! Cute!!! Ladybugs make me smile! Have a great weekend! Oh, isn't that just one of the cutest sets ever?? Love your card! That's cute Stephanie! Love the ladybugs!